The clock and trigger distribution card is a simple and passive component that allows to synchronize several systems externally. No programming is necessary. A clock can be fed in from an external device or as an option an internal clock oscillator can be equipped by the factory. This clock is then also used to synchronize an external trigger signal into the clock domain. Both, clock and synchronized trigger, are then fed into a maximum of 17 different systems. Each system can be a single card or a synchronized set of cards that run with an internal star-hub. Extending the number of synchronous channels to more than one system can offer. Using a full setup one can theoretically access 17 systems with 16 synchronized cards each making a total of 16 x 17 = 272 synchronous cards. If each card has 16 channels this setup can operate more than 4000 synchronous channels. Running multiple fast streaming systems with a low number of channels each. 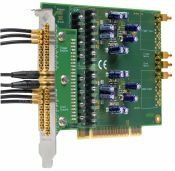 Synchronizing fast M3i or M4i cards with slower M2i cards.